Are you the owner of Camp Run-A-Muck RV Park in Hyder Alaska? Did you know that you can convert this page to a complete listing of your services today for no cost at all? Camp Run-A-Muck RV Park & Campground is located in coastal town of Hyder Alaska along the scenic border of Alaska and British Columbia. Hyder is often referred to as the "Grizzly Bear Capital of Southeast Alaska". Welcome to Camp Run-A-Muck Campground and RV Park located in the almost ghost town of Hyder Alaska. 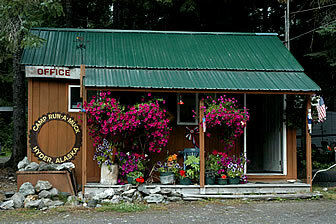 Camp Run-A-Muck RV Park in Hyder Alaska is the only full service campground in Hyder AK. Both Stewart BC and Hyder Alaska see a pretty steady flow of tourists from mid-July through early September when large numbers of Alaska's wild salmon return to the creeks to spawn. With the glowing reputation of the bear viewing area operated by the U.S. Forest Service at Fish Creek, Hyder's popularity has been on the rise. Welcome to Camp Run-A-Muck in the “Friendliest Little Ghost Town in Alaska”. Directions — At the end of the Glacier Highway and just 4 miles from Stewart B.C. 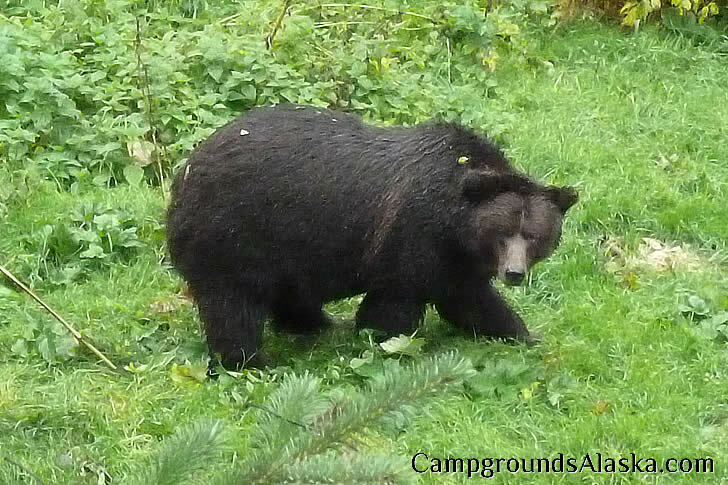 Description — RV Campground in Hyder AK. Dry Sites — Separate location with campsites for tents and small campers. Dates of Operation — Year Round - Weather Permitting. Services — Restaurant dining at the Sea Alaska Inn. Also offers a unique gift shop. Additional Amenities — Bathrooms, Laundromat, pay showers, tables, pop machines, pay phones, free WIFI, fire pits and dry pavilion. Payment Methods Accepted — Visa, MasterCard, Discover, Both U.S. and Canadian Currency. Getting to the Fish Creek Wildlife Observation Site from Hyder Alaska. This is the only bear-viewing site in Alaska that is accessible by road. A 41-mile detour off the Cassiar Highway at Meziadin Lake Junction (on Highway 37A) brings you to the neighboring towns of Stewart, British Columbia and Hyder, Alaska at the head of Portland Canal. Follow the gravel-surfaced Salmon River Road through Hyder and continue three miles north. A sign marks the Observation Site, and the parking area is on the left just past the Fish Creek bridge. Shuttle vans from Hyder and Stewart provide another way to get to the Observation Site for those who do not want to drive or park large RVs or trailers. These shuttle services are currently provided by Sealaska Hotel (Camp Run-A-Muck)in Hyder (ph: 250-636-9001) and by Seaport Limousine in Stewart (ph: 250-636-2622). Visitors are encouraged to use the shuttles to help minimize traffic congestion at the Observation Site.